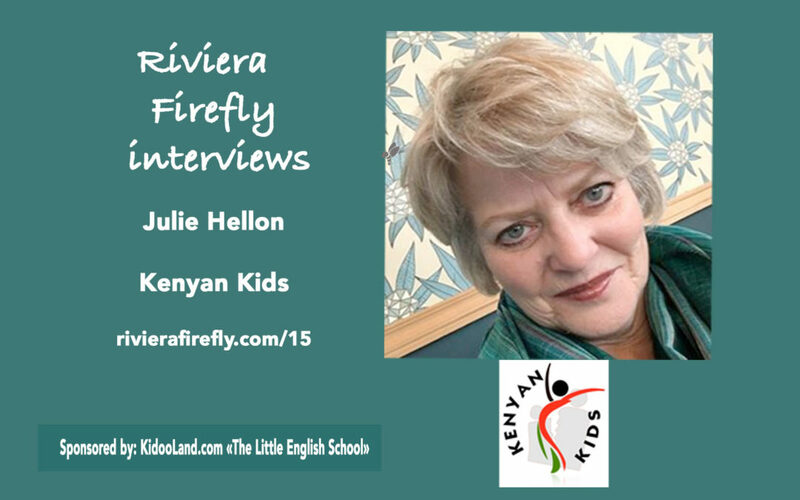 In this Riviera Firefly Episode 15 Antonia chats with her guest Julie Hellon about why she set up a charity saving children in Kenya. The challenges , the ups the downs the impact on family life. Why we need to keep helping supporting, volunteering and how even 1 euros can make a massive difference in the life of a child. [0:01] What to expect from the programme. We’re going to get right into this episode.. Julie Hellon Kenyan Kids ..I am hugely inspired by her heart, her tenacity and her compassion. Life is so busy we forget sometimes about the world around us where we aren’t living in such cosy conditions..
She is going to tell us about the charity she set up Kenyan Kids why she did it, the impact on her home life, the new Familia project .. it’s really touching and moving please take some time out of your busy day .. You know every decision Julie makes for the KenyanKids organisation has to take into account that it has to make a commitment to any child entering their doors. So a 7 year old has 12 years ahead before they will be self sufficient and they need to ensure that they have the funds to complete on that promise. As you listen keep in mond there are many ways to take action, make a difference .. I have started by spending time interviewing Julie and editing this podcast..I’m passing the baton to you now Firefly .. I think we all need to hear this one. [13:00] The lightbulb moment – on the rubbish dump. [14:30] The biggest challenge when launching the charity. [17:00] Asking people for money, what does the money go on? [18:00] Deciding where to focus the efforts street boys . The nursery school idea began..Julie opened the school as a white foreign woman..
[20:00] Requirements for going to school and fees for sending a child. [26:00] The River Between by prolific Kenyan author Ng?g? wa Thiong’o that was published as part of the influential African Writers Series and Small read this to Julia when she was sick and opened her eyes to FGM. [28:30] The lack of social services for girls on the streets and orphans. [30:30] Challenges bringing “Small” back to live in France. His role as an ambassador. [35:00] life in Kenya is in complete contrast to living here?. Julie couldn’t tell me enough about the amazing fund raising effort Paddy Warwick’s runners did in last years marathon in November 2016 . They raised and incredible amount of money and allowed the charity to secure a premises for a decent future. Maybe you were a runner, or you are a sponsor ..or like Keren Sharp you are continually baking fabulous cakes to sell ? each penny goes to those Kenyan Kids. Could you commit to 50 the price of a dinner or if you dine in better places than me then a nice round 100? with interesting tax breaks ..or have you got some fund raising ideas that could make even more ? get onto her website and set up a standing order. Awareness for our own teenagers..Get Julie to come in and talk to your school there must be international schools you have contacts with .. kids, teenagers could and should be interested in the world around A talk by Julie and a project getting them to raise a tenner to send a child to school..what a great learning opportunity that would be for the class. For little kids they can do their bit too ? Remember a 1 euro a month keeps a young girl in security .. she can buy feminine products and doesn’t need to sell her body to a teacher (yes that happens Something that your daughter, sister, niece takes for granted. I’m going to ask my daughter to earn some pocket money and do this regularly. Donate through their website use paypal it’s easy. They need to keep the profile up, communicate to donors , encourage people to get involved..perhaps you could keep their facebook page updated say 1 hour a week ? you’re probably on FB anyway so what would an extra 15 minutes here and there make? Or Admin the killer of any business can you help there ? a self starter who can work their way around a form whould be a life saver..
OK so lots of ideas ? and I know what it’s like we have the best intentions and life whizzes by .. so make you make me a mental commitment right now .. something you will do lets make a time frame ok within 30 days. A contact / a donation do something. Have you thought of your idea. Say it outloud ? then we have an agreement. send it to many people .. lets say at least 10 people .. if every listener does that .. the chances of Julie getting in contact with the person who can fill in that form , the person who will get a corporate donation, the team that will be the next Paddy Warwick fundraiser is much more possible ? those possibilities are out there . Please share , like, review and subscribe to the podcast and this will help the episode get more visibility. Thanks so much for listening. Now go and ake some action ! www.paddywarwick.com Marathon runners raised enough money to save kids in kenya.